Disclaimer: I received free product in exchange for this post. All opinions are my own. 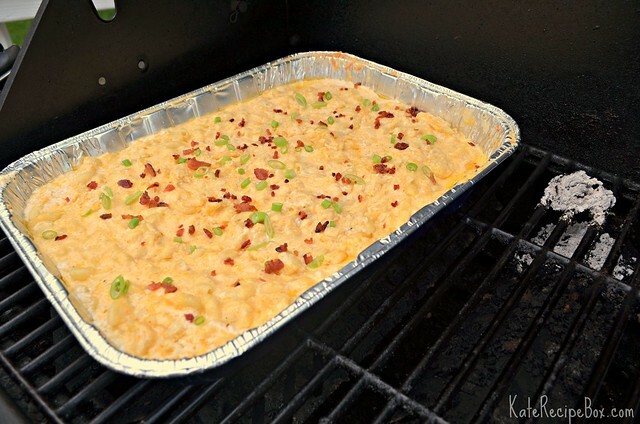 I never really considered macaroni and cheese a cookout food – until I had kids. Now, macaroni and cheese is an all-the-time food. I’ve been dreaming up an on-the-grill version for a while and I knew Cookout Week was the perfect opportunity. It was also a great chance to try out Smokin O’s. Smokin O’s is one of our Cookout Week sponsors and they sent us a sampler pack to try out. Smokin O’s are a great way to add smoked flavor on a gas grill – this recipe features an Applewood Smokin O. And this makes a creamy, delicious, smoky mac and cheese with almost no effort. It’s a perfect cookout dish! Prepare the grill with the Smokin O. Directions are here. Spray a disposable 9×11″ pan with non-stick spray. Pour in the elbow macaroni. Pour the melted butter, milk, and half and half into the pan an stir to combine. Stir in the cheese, salt, pepper, mustard and paprika. Place the pan on the grill over indirect heat with the cover closed. Cook for 1 hour 45 minutes to two hours – stirring every 10 minutes for the first 40 minutes. When cooked, top with green onions and chopped bacon before serving.